The Valley of Barovia is a secluded place. A part of the world that was torn apart and set inside small demiplane when Strahd Von Zarovich killed his brother Sergei, thus sealing the blood pact with the Dark Powers. With Strahd’s permission a person can enter or exit Barovia. As you know, the borders of the valley are marked by a thick mist that no one can cross to exit, unless Strahd wills it. He cannot leave either, that’s his curse. The only ones who can travel in or out of Barovia are the Vistani, since Strahd owes them that liberty due to a centuries old pact. Though Strahd is evil and apparently has no care for his subjects. He is still the lord of the land. If he was an evil psycho everyone would be dead already. After centuries of being trapped inside Barovia, Strahd and his allies could have eradicated everyone already. However, this is not so. Even the villages of Barovia have appointed Burgomasters who are part of Barovian noble families. The Indirovich, Vallakovich and Krezkov families have been in power since forever, Strahd appointed their ancestors to rule over those villages and has let them do so until the present. Even when the last remaining son of Baron Dimitri Krezkov died of sickness, it is vaguely implied that Strahd sent The Abbot to raise him so that the bloodline was not lost. I infer that there are two reasons for these occurrences. The first one is: Strahd is from noble birth and the lord of the land, and although he is not a protector of Barovia, he does enjoy his position of power. There would be no power in a land with no subjects to rule. The second reason is his “lawful” alignment predisposition. Just as he respects the old pact with the Vistani, he respects the appointments of the different Burgomasters and their families’ nobility. Going back to what I just mentioned, Strahd is NOT a protector of this land. It is his land. He is the land. And as a direct projection of his own disposition and personality, the land is dangerous. It’s hard to judge by just looking at the map, but Barovia is not a big place. Each hex in the map equals 1/4 mile. According to the DMG (page 242), the standard travel speed is 24 miles a day in normal conditions. Then an adventuring party can move up to 12 hexes in an hour (3 miles). Trying to count more than that doesn’t seem practical, there’s over 80 hexes from the Village of Barovia to Vallaki, still that trip takes 5.8 hours (17.4 miles). Travel is still extremely dangerous; the book sets the bar at rolling for outdoors random encounters every hour. Not all encounters are battles, some of them are just things that can happen or thing to be found. The Village of Barovia is unprotected from outside forces and that’s why the population is so small, and has been decreasing over the years. Vallaki has a palisade that helps keep some of Strahd’s creatures like wolves and minor undead at bay. Krezk has a stone wall and the Abbey. This is the most defensible town, but they lack fighting people. A common theme for Barovians is that they do not go outside of the villages if they can help it. Only a few individuals dare travel the open lands of Barovia. Most people are born and die in the same place. An example of this is Ismark and Ireena who are both nobles, have souls and probably a better education than most, yet none of them have ever gone out of the Village of Barovia when the adventure begins. Vistani are the exception. The Martikovs are probably the only ones who travel often the roads of Barovia. After all they are the only source of wine in the region and it is stated that they deliver to the three villages free of cost. 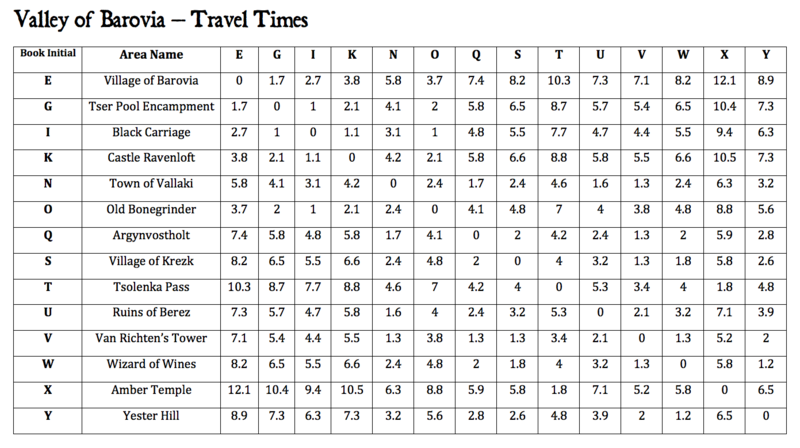 This is a table of travel times between the most important places in he valley. Some places were left out for space and convenience. What’s most important here are the distances between the villages, the castle and a few other points of interest. It is assumed the party is traveling at normal pace and the figures are expressed in hours of travel. If you need to calculate the distance in miles, just multiply the number by 3 (which is how many miles the party moves in an hour). What’s next is a list of extra encounters the party can come across while they go from place to place. Some of them are battle encounters, others are just strange finding and a few of them include Count Strahd. 1.- Lost child: The party finds a young child sleeping in the open next to a tree. The child is sickly from being in the open and starved. The child comes from Vallaki and tells the story of an old lady that came and took him and his sister from their house in Vallaki. He escaped and tried to go home and ask for help, but got lost. His sister is captive of the three hags in Old Bonegrinder. 2.- Crippled Lumberjack: Deneth, a lumberjack from Vallaki was attacked by wolves during the night. He managed to scare them off. They bit off his foot and ran away at dawn. He can’t walk without aid and asks for help in returning to the village. Optional: Deneth can also be a werewolf posing as an innocent person, he’s just baiting the party. He waits for the best moment, when they are at their weakest to howl at the moon and attack. His pack is nearby. 3.- Are you dead? : This encounter assumes that a party member was charmed by Strahd during the night, then impersonated by him. The next day, the party comes across a small stone mausoleum. Inside, they find an old stone sarcophagus. There are signs of recent activity here. If the sarcophagus is opened, the charmed party members lays inside, apparently dead (Feign Dead spell). This alone should become a full party argument. When you judge appropriate, Strahd reveals himself and fights them for a few rounds before turning to mist with an evil laugh. It’s all a ruse, since the “dead” PC is just a pawn in this joke. 4.- What did this? : The party finds odd foot prints. They appear to be those of a goat, except they are too big. There’s also evidence of a long tail being dragged. After following the trail, they find the carcasses of two deer. Both have a puncture injury similar to that of a spear. What’s disturbing is that both carcasses are dried out, as if all liquid and hydration had been sucked from them through the puncture point. After a few meters the monster’s trail simple disappears. Does it fly? 5.- Quake !!! During a rest outdoors, the ground vibrates for a minute. Then suddenly a powerful force breaks the ground open. A scar marks the land as it tears open. Have any PC close to the opening roll a Dexterity save (DC 13). A fail means the PC falls through the opening 30 ft. (3d6 damage). They fall in a cavern chamber that has one or more openings leading out from it (your choice). This is good to introduce a small dungeon or undead encounter. 6.- Cursed Barovians: While traveling near the sunset, the party catches up with a group of 3 Barovians traveling in the same direction. They explain they are merchants and may show them their wares. The hold a secret, they visited the Amber Temple and accepted a Dark Gift. They appear human but they are now a form of ghoul and can only find nourishment from eating man flesh. When sun sets, their true form is revealed and they attack. 7.- Save the horse: The party hears the anguished neighs of a horse nearby and wolves howling. After investigating they find a poor horse trying to scare of a pack of wolves. While dealing with the wolves, the horse suddenly transforms into a giant spider, dire wolf or similar creature and attacks. This is Strahd himself assessing the PCs strengths. 8.- Insurrection: The party is approached by a mob of Barovians on the road. These are villagers from Vallaki armed with sickles and torches. They ventured out in search of two villagers who were expelled from Vallaki by the Burgomaster Vargas Vallakovich for “Malicious Unhappiness”. Only one of the villagers was found, the other was probably eaten by wolves. They are now going back to Vallaki in full-insurrection mode. Izek Strazni and the guard are ready to repel any rebels from returning to town. If the party defuses the mood, then the villagers are let back inside with no trouble. 9.- Old man: Near the road there is an old man eating something close to the fire. He invites the adventurers to have a bite with him. He’s an old Vistana traveling west alone. His intention is to reach Krezk and then exit Barovia there. He can tell a good story: he was there one year ago when the foreign wizard (Mordenkainen) rallied the peoples of Barovia against Strahd. After the wizard was defeated and thrown down the cliffs of Ravenloft, he was the first to climb down there with a friend, to find the man’s possessions. They did not find Mordenkainen but they found his spell book. As they couldn’t read it they decided to sell it, however they were attacked that night by living scarecrows. His friend died during the conflict before he decided to hand out the book. An old ugly lady came out from the darkness and took the book (This is Baba Lysaga). 10.- Burial: The party comes across a scene of battle on the road between settlements. There’s an upturned cart, two dead horses and some Barovians killed by some type of big beast. No treasure is found. Important for this encounter is to have a relevant NPC that the party knows dead here. It could be Rictavio, Ezmeralda, a Martikov, a priest, Blinsky. The party will mourn the loss of the acquaintance an maybe bury them. When they next return to the appropriate village, said NPC is alive. Whether the battle scene was an illusion or the NPC is Strahd impersonating him is your choice. 11.- Sick Elf: Sitting by a tree is a dusk elf. He’s alone and sick. He can barely speak and is delirious. Whatever happened to him, he cannot be helped and will die soon. He carries a traveling bag, it is full of bones, and body parts from humans. If dissected, there’s human bones and flesh in his belly. 12.- Save us: A group of scared Barovians from Vallaki are running towards the party. They ask for protection, as they are being followed and their pursuers won’t stop until they are caught. A few minutes later, unless the party does something to avoid it, arrives Izek Strazni with 5 guards on horseback. They wish to arrest the fugitives to be put on the stocks in Vallaki for not following the Burgomaster’s orders. 13.- The dark lord’s hand: Going in the opposite direction as the party is Rahadin on horseback. He is traveling to the Amber Temple or one of the villages. If the party have not encountered him before, he introduces himself as Strahd’s right hand and welcomes them to Barovia. He will warn them against trying to visit the castle unless invited. If the party have already met Rahadin then what happens will depend on that first encounter. A battle may very well ensue. 14.- Knight’s unrest: The ghost of a man in scale armor approaches the PCs during the night. It is not aggressive and asks for help. He explains that he belonged to the Order of the Silver Dragon a very long time ago. One day he was ambushed while night traveling by a group of undead. He died that day. If his remains are recovered and taken to Argynvostholt he will be able to rest. He remained a ghost because he was traveling to the mansion after the main rally to oppose Strahd’s forces. Not being able to join his brothers in arms is a torment that never let him rest. He is unaware that the order doesn’t exist anymore. He can also tell stories about the order but will not reveal Argynvost’s true nature because that was a secret only known by anointed knights. 15.- Vallaki’s heir: The party hears a voice and strange sounds in the wild. From afar they can see a young man in heavy coat. He appears to be training cats, when approached, it is clear the cats are undead. Victor Vallakovich is trying to see if his undead cats still possess their hunting abilities. He’s also searching for rare herbs and ingredients for his experiments. 16.- Get out of the way: Coming from behind the party is a black carriage pulled by 2 great black horses. The carriage comes at full speed. The party will have to get out of the way or be trampled by Strahd’s carriage. 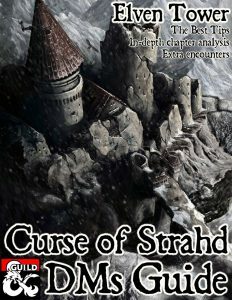 If stopped or attacked, Strahd attacks with full force for a few rounds before disappearing. Alternatively, he fights full force until possibly being defeated by a higher level party. It doesn’t matter to him to lose like this, he can reform later on. It’s also important to him to assess the full strength of the party. 17.- Lost travelers: A group of travelers from Daggerford (or any settlement outside Barovia really) stumbled upon the mists the previous day. They have no knowledge of Barovia and are looking for the nearest settlement. This is a good way to introduce a merchant with wares from outside the valley or to introduce an NPC related to someone’s background (cheesy I know). 18.- The Circle: Strahd is watching from a tree. He casts a Wall of Fire spell in circle form and encloses the PCs in it. The ground erupts as Strahd Zombies, Ghouls, Skeletons or any other creatures of appropriate CR for the party come out and attack. For added difficulty, Strahd shoots spells from the tree or charms a PC. 19.- Lost shipment: Recent cart tracks on the road suddenly go off it and into the woods. There are also wolf tracks. After following the trail, the party finds an abandoned horse cart loaded with several caskets and barrels of wine. Horses are gone. The cart appears to have been here for a week. Alternatively one or more of the wine barrels were poisoned by the twig blights. 20.- Unicorn: From the trees emerges a beautiful white horse. A warm light emanates from it’s body. A golden horn protruding from its white forehead. Radael is an unicorn passing through Barovia. It is one of the few creatures that can’t be bound by the mists. Unicorns are free to exit the valley. It can’t however help other people exit Barovia, either by riding him or by teleporting with him, it just doesn’t work. The unicorn can bring news from the outside world. This is a great encounter for good aligned parties, specially meaningful if the unicorn can heal a party member from the effects of poison or disease. It offers his teleportation ability within the valley. Radael knows he cannot help them get out. How can unicorns exit the valles? They don’t originally. I wrote that the unicorn is just passing through. 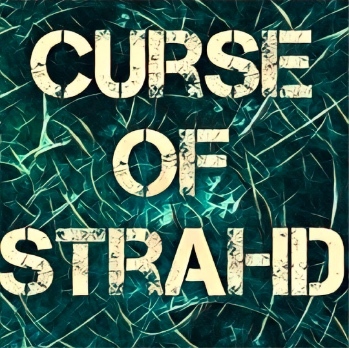 For “What did this?” is there a creature from the Curse of Strahd hardcover you had in mind here, or is it left up to the imagination of each individual DM to pick their own creature? Totally fine with the latter, but was curious if it was the former. I live in Mexico and I was thinking about our depiction of the chupacabras. It’s a supposed monster that eats livestock by puncturing them and sucking out all moisture from them.